In a setting like this, you’ll hate to go inside. Grill and entertain on the large deck, enjoying the mountain views and rolling hills from your rocking chair or porch swing. Then close out the evening with a campfire in the fire-pit. Or soak in your luxurious, private hot tub – also with a gorgeous mountain view! This is relaxation at its best, with stunning scenery and open spaces all around – and no other homes crowding in on your serenity. You’ve picked the right spot for an unforgettable mountain vacation! 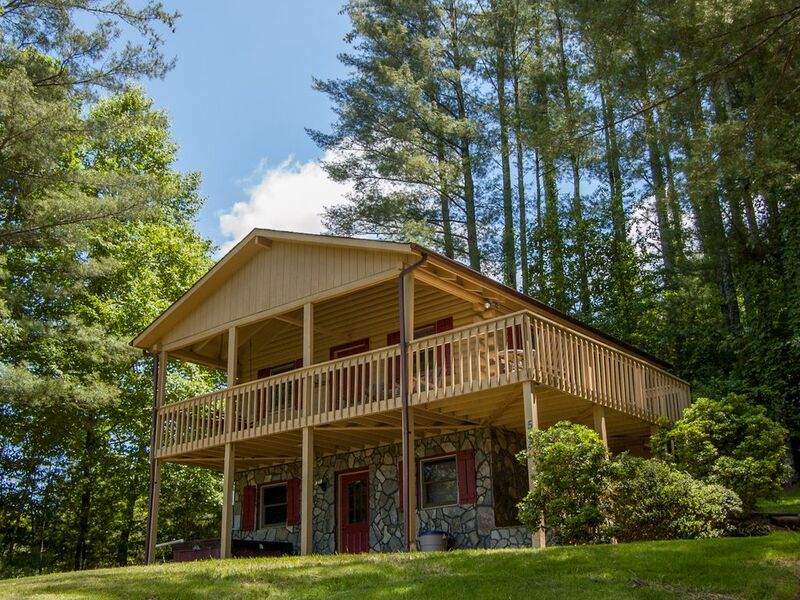 Riverbend Retreat is in the northern part of Ashe County, very near the New River State Park, where you can enjoy all the mountains have to offer – canoeing, tubing, kayaking, fishing, hiking, picnicking, and all the fresh air you can breathe. You’re also close to the Virginia Creeper – North Carolina and Virginia's premier mountain biking trail, which stretches 34 miles from Abingdon, down thru the lovely town of Damascus, along the Whitetop Laurel River and up to its highest point at Whitetop Station, near the NC state line. The Virginia Creeper Trail is open year round to hiking, mountain biking and horseback riding. Don’t miss this ride – a blast for the whole family, with several bike rental shops to serve you. In the High Country, gorgeous scenery awaits you at every turn. In the nearby mountain town of West Jefferson you have restaurants and terrific shopping, including antique stores and art galleries. There’s even a movie theater. This is small-town Americana at its finest. Drive a little further to Boone or Blowing Rock, for an even wider assortment of dining, entertainment and shopping options. Tour the campus of Appalachian State University, or visit our craft breweries. And don’t forget to take a drive along the Blue Ridge Parkway, for some of the country’s most awe-inspiring views. You’ll understand how our mountains got their name! If you’re dreaming of a snowy mountain winter, you’ve also come to the right place. Enjoy sledding, snowboarding, skating – and of course skiing – all winter long. Or watch the snow fall softly and serenely outside, while you’re cozy in the cabin! Very nice cabin. Everything was clean and comfortable. I enjoyed my morning coffee on the porch watching the squirrels play in the trees and evenings in the hot tub. The 3rd step on the outside does need some attention as it is not level and made trips up and down a little difficult. Also would have been nice to had a non slip mat in the showers because they are very slick. Other than that everything was great. We were looking for a rental in the northern part of mountains that was a little remote! And we found it! The cabin was clean and nice for the most part. The kitchen does lack some supplies. Their was no television in the upstairs den area; only downstairs. The WiFi is not good but that could have just been the mountains.